Beckinsale is a good actress and does her best with the material. In the early 1900's, the aristocracy of this country were ashamed of their physically and mentally ill children. They created secret rooms in their homes to hide away their less than perfect offspring, never allowing them to see the outside nor interact with other people. These rooms were called the disappointments room and they were common all over the country. Twentieth Century Fox has woven a tale around these old places and created a horror movie called The Disappointments Room, which is out now on Blu-ray and DVD. Dana (Kate Beckinsale; Underworld) and her husband Dave (Mel Raido; Legend) needed a change and decided to buy an old house outside of New York City so Dana could renovate it since she is an architect by trade. This move was to be a new beginning for them and their son, Lucas (Duncan Joiner; Some Kind of Beautiful) after the death of their infant daughter due to a tragic accident. This seemed to be exactly what Dana needed, or so they thought. Almost immediately after moving into the old house, Dana began seeing things and having nightmares. Things got worse after she and David found a locked room in the attic that Dana manages to open with an old key she found. She then starts having visions of a man who kills his disfigured daughter after locking her the home's disappointments room. The visions seem so real that she sees people getting killed and a rabid dog eating Lucas. Of course none of it is real… or is it? Wentworth Miller (Prison Break) and D.J. Caruso (I Am Number Four) wrote the script about an interesting idea but, unfortunately, the dialog and story are less than mediocre. I feel there could have been so much more done with the concept and they simply missed the mark on this one. I was disappointed (pun intended) there wasn't more backstory about the girl in the room and her parents. I also wanted to know more about Dana and her issues after losing her daughter, as well as the relationship with her husband. Finally, for a horror movie, it wasn't very scary. Beckinsale is a good actress and does her best with the material but there simply isn't enough to work with. Raido is forgettable, but an enraged Gerald McRaney (Major Dad) as Judge Blacker, the 1900th century aristocrat who kills his deformed daughter, is sufficiently sinister. Lucas Till (X-Men: First Class) as handyman Ben is ok but his flirtation with Dana is kind of creepy as she is obviously significantly older than him. Caruso's directorial style is uneventful and his choice to make quick cuts between the present and the past are disconcerting. His direction makes an already confusing plot even more confusing and doesn't help the audience to become invested in the story or the characters. He also doesn't include many horror elements, which might make the film scarier. Besides the theatrical trailer the DVD has only has one extra, which is a short making of feature called inside the disappointments room. The extra doesn't offer much in the way of content and doesn't enhance the film at all. The movie isn't scary, doesn't have much of a plot, feels incomplete and drags, which is saying a lot since the movie is only an hour and a half long. This is one movie that I can't really recommend because other than Beckinsale and a unique idea, there isn't much to work with or enjoy. 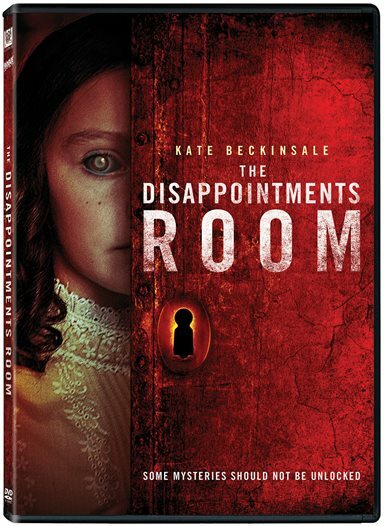 Download The Disappointments Room from the iTunes Store in Digial HD. For more information about The Disappointments Room visit the FlickDirect Movie Database.